Jihadi Islam is in fast forward mode not only in India but across the globe. What you are about to read is an alarming phenomenon which is another flank opened by the global jihadists. The soldiers of Islam are waging a jihad against the so-called ‘kaffirs’ all the way from America to the Philippines via Europe, Middle East and the Indian sub-continent. Case in point: the fast-forward epidemic of urban rowdy bike-riders have managed to hold the citizens of Delhi to ransom during the last two successive years. There is a method in their madness. They are conveying a warning to the Indian masses (read Hindus) of the coming clash of civilizations. In June 2013 the denizens of Delhi, especially the motorists and pedestrians on Delhi roads had to wade through a harrowing experience of lawlessness throughout the night of the Muslim festival of Shab-e-Barat . The unsuspecting motorists and commuters were caught in a frightful melee caused by thousands of skullcap wearing jihadi motorcyclists. Many of them were gesticulating at motorists, especially to frighten the lone women car drivers, while performing stunts on the roads of New Delhi. Their shameful antics and rowdy behaviour was roundly criticized by the media which faulted the police for the monumental breakdown of public order on the fateful night. Mercifully the police were able to prevent the jihadi bikers from going berserk. They issued challans to nearly 1500 to 2,000 defiant bikers and impounded more than 300 motorcycles. Even then after midnight, many bikers tried to confront the policemen by throwing stones at them. Many roguish bikers could not be caught on the spot despite the best efforts of the police personnel. There have been sporadic reports of skullcap-wearing bikers trying to create similar lawlessness in some other cities and towns of the country. Unfortunately, the intelligence agencies and police officers have failed to read the tea leaves of the fast approaching ‘faultline conflicts’ forecast by Samuel Huntington in a seminal essay in 1993 which was subsequently elaborated in his famous tome on the clash of civilisations. Our intelligence agencies have refused to learn any lessons from the havoc played by jihadi bikers in several parts of the world. Well known proactive members of Islamic outfits in several countries have been organizing Muslim bikers gangs. 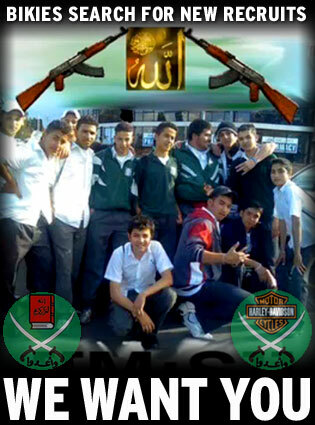 Some of them operating in Sydney and other towns of Australia call themselves as ‘MBM’ or Muslim Brotherhood Movement. Apparently, the bikers claim to represent the ideals and goals of the notorious Muslim Brotherhood of Egypt. There is another gang of Muslim bikers known as ‘Soldiers of Islam’, or “Sons of Islam” who have been operating with impunity in Australia’s Gold Coast, near about Mermaid Beach. Similarly in the United Kingdom, there is a bikers gang organized by Jamal Richards who had also founded an outfit called ‘Concerned Muslim Citizens’. Jamal is also the organizer and leading light of a devout Muslim bikers gang called ‘Deen Riders’ which was established five years ago. The Deen Riders ultimately plan to ride on motor bikes to the Hajj in Saudi Arabia. According to Jamal Richards, his group of the faithful proposes to call the bike journey to Hajj as “Enduring Hardship for Allah’s Pleasure”. He claims that people love to see the shining bikes of Muslims. The Muslim bikers phenomenon has now surfaced in the USA. One such organization is known as United Muslim Bikers (or UMMA M.C. ).They have branches and chapters of bikers in California, Oakland, Las Vegas, Atlanta and other cities in the East Coast. A number of hardnosed Islamic preachers like Hasan of Oakland, Naim of Las Vegas and Dawud of Los Angeles are associated with the bikers movement across America The United Muslim Bikers also try to impress on their members that Prophet Muhammad was an excellent horse rider of his times. In today’s world, the motorbike is a substitute for the horse. The UMMA Club is meant for the Muslims who love to ride motor cycles. The Muslim bikers of the USA had also tried to organize a ‘Million Muslim March’ on the 12th anniversary of the 9/11 jihadi attack. The American Muslims Political Action Committee was behind the proposed Million Muslim Rally and its avowed objective was to counter the unfair fear of Muslims caused by the 9/11 terrorist attacks. But their attempt to cow down the Christians was thwarted by a determined nationalist group who threatened to organise a two million bikers march against ‘Fear’ caused by Islamists. Though falling short of the 2 million mark, several thousand Christian bikers rode into Washington, D.C. on September 11. After thwarting the Million Muslim March, the national coordinator of the Christian bikers march Belinda Bee, announced that they plan to be present on 9/11 every year. Interestingly, the Muslim bikers also promised to return for a bigger show next year on the 9/11 anniversary. So, a race for supremacy appears to have been joined by the bikers of the two communities—the Muslims and the Christians. It is time that the Indian police officers and intelligence agencies woke up to the reality of the bikers menace seen in Delhi for two successive years and try to learn lessons from the growth of Muslim bikers gangs in several countries. It’s equally important for Hindu leaders to awaken the masses of the danger posed by jihadi bikers. As explained by the United Muslim Umma of Motorcyclists, they are going to use motor-cycles as the 21st century horses of jihadi Islam. In Delhi, the gangs of Muslim bikers try to gather in the infamous ‘No Go’ areas where entry of police is invariably resisted by aggressive rowdies. During the UPA regime, the number of ‘No Go’ areas in Delhi and several Indian cities has grown manifold, especially after the Intelligence Bureau, NIA and CBI shifted their focus from Indian Mujahideen and SIMI to the so-called threat of ‘saffron terrorism’ as exemplified by Rahul Gandhi in December, 2010, during a meeting with the US Ambassador,Timothy Roemer. More importantly, this allegation was repeatedly emphasized by Digvijay Singh, a heavy-weight political guru of Rahul Gandhi and the former Home Minister, Sushil Kumar Shinde. The truth is different altogether. India’s intelligence agencies like the Intelligence Bureau and the Research & Analysis Wing of the Cabinet Secretariat, including the top political echelons of the government are fully aware that the Inter Services Intelligence of Pakistan has a long term plan to overrun India, annihilate its Hindu population and establish a powerful caliphate in this part of the world. Their ultimate goal is to convert the entire subcontinent into Dar-ul-Islam. For achieving their sinister objective, the ISI has managed to plant thousands of fifth columnists and fellow-travellers of militant Islam across the country. The notorious terrorist of the jihadi outfit Indian Mujahideen, Yasin Bhatkal was arrested on the Indo-Nepal border near Dharbhanga. His interrogation by the NIA revealed that Yasin had planned to carry out multiple jihadi attacks across the country with help of his close associate, Waqas, who was an expert bomb maker and an active participant in the notorious Hyderabad blasts. Among other things it was admitted by Danish Mohammed Ansari, another member of the IM in a statement recorded by the NIA under section 164 Cr. P.C. before a Magistrate that in 2010 Yasin Bhatkal had confided in him that the IM had already enlisted nearly 33,000 volunteers for carrying out subversive activities and terror attacks in India. The point to note is that a statement recorded under Section 164 Criminal Procedure Code is admissible as evidence during trial. Unfortunately thereafter, the trail went cold. Interestingly neither the NIA nor the Intelligence Bureau were able to make any breakthrough for identifying and arresting thousands of fifth columnists and militant volunteers who had joined the Indian Mujahideen. The threat posed by the skullcap-wearing rowdy bikers of Delhi and other cities needs urgent attention of the intelligence agencies and security experts. The gangs of bikers have become a major threat to the maintenance of law and order. It is time to remember that today, India is under the siege of thousands of fifth columnists. Could it be that the rowdy bikers operating in Delhi and many other cities are part of the 33,000 members enlisted by Yasin Bhatkal and his associates for subverting the Indian nation? In any case, it is time to take stringent action against the growing menace of these skull-capped jihadi bikers.